I wanted to get this month’s hot pad to you before Father’s Day, because I made this one with the guys in mind. They might not be the obvious recipients of something like this, but it’s definitely something they can use. It can sit on a desk for their coffee mug – if they’re anything like the two men in my house, an ordinary coaster is too small for the giant mugs they prefer. Do they barbeque? Hot pads are great for hot food. I have to keep a pad under my phone on my desk or it sounds like the house is falling when it vibrates – this is perfect for that, and I’ll bet he has a phone too. Of course, if he’s not convinced, you’ve got a new hot pad for yourself! Flip the rounded pieces for the paw pad over and trace onto the Wonder Under. Number the pieces and mark the top of each. Cut out and iron onto the felt. Cut out from the felt. Cut two of the large paw from the brown fabric, one from the InsulBright, one from the thin batting and one from the fusible interfacing. Cut four claw A, four claw B and two claw C from the white fabric. Cut two A, two B and one C from the fusible interfacing. Iron the interfacing onto one paw and the appropriate claws. 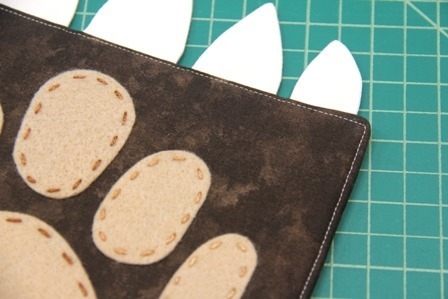 Remove the paper backing from the pad pieces and place them face up on the interfaced paw. Iron gently from the front, then flip and iron from the back, to prevent crushing the felt too much. Stitch around the outside of each piece with embroidery thread using a basic straight stitch. If your hot pad will be used around food and need a lot of washing, you might consider cutting the pad pieces from cotton fabric and appliqueing on with a satin stitch on your machine. Pin the claw pieces right sides together, with one interfaced piece in each set. Stitch, leaving the straight edge open. Clip the tip and trim the seams. Turn right side out and press. Stitch around the outer edge, leaving 3” open at the bottom. Clip the corners. Turn right side out. Press, turning in opening. Topstitch around the outside edge. That’s it! The part that took the longest for me was the embroidery stitching, but the rest was a piece of cake. What do you think – is Dad up for this, or could you not bear to give it away?